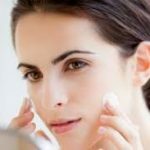 In the modern world, women are leading busier professional lives and are more health conscious than ever before. 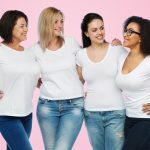 And as more women are packing more meetings and gym sessions into their schedules, it’s becoming more and more difficult to sustain the proper balance of nutrition and lifestyle. One of the hardest parts about keeping to a proper diet is snacking. 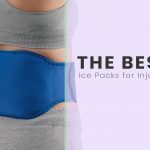 For women who are on-the-go and don’t have much time for a healthy, balanced meal, not having a quick snack between meetings or before going to the gym can be a challenge. For women with a busy lifestyle who just need a quick healthy snack in the afternoon, the best solution is to try protein bars for women. Nowadays, companies and brands are trying to make protein bars specifically tailored to suit a woman’s nutritional needs. Not only are they healthy, but they also provide the nutrients necessary for a healthy female diet. 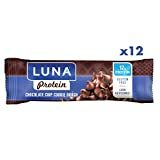 Some companies, like Luna, specialize in creating the healthiest protein bars for women possible by including ingredients designed to help a woman maintain a balanced nutritional intake with increased vitamin D and soy protein. When taking a look at some of these protein bars, you have to think about how they will fit your lifestyle and diet. Do you want a nutritionally dense and heavy bar that will replace meals? Or do you want a lighter snack with fewer calories but also less protein? Do you need something that is gluten-free and GMO-free? 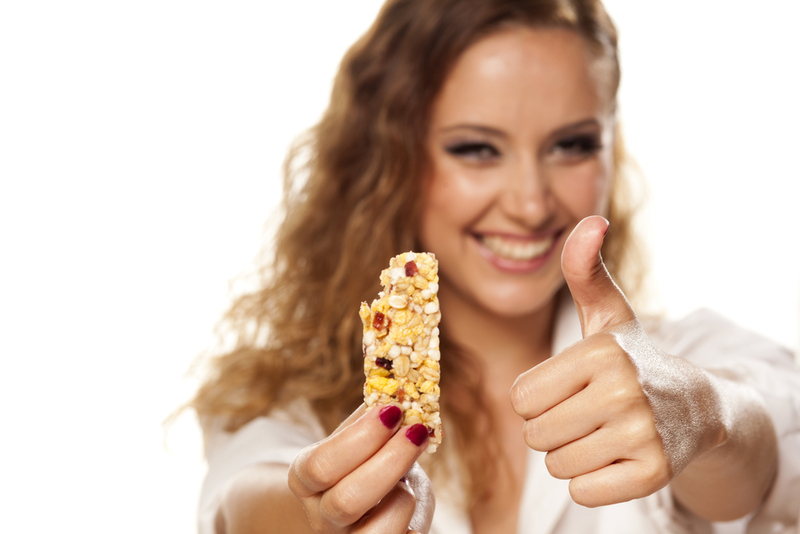 Regardless of what your needs are, in this article, we will be taking a look at some of the top protein bars for women, and there is something for everyone. 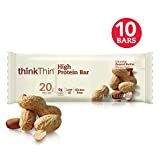 If you’re looking for the best protein bars for women to lose weight, then you should consider bars that are lower in calories and higher in protein and fiber because this will tide your hunger over for a longer period of time. If you’re looking for the best protein bars for women to gain weight, then think about buying protein bars that are high in calories, carbs, and protein. You can also consider the micronutrients that each of these bars are packing. If they are rich in vitamin D and plant proteins, then they can protect against osteoporosis, which tends to erode bone mass as women age. Soy protein also increases estrogen levels, which can be a healthy option for women. Less common sources of protein are pea protein and rice protein. 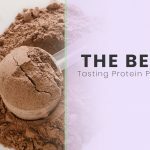 Pea protein is easily digestible and is a great option for those who are hypoallergenic, and it’s also relatively inexpensive. Rice protein is a good alternative for those who are lactose-intolerant or for those who are vegan. Egg protein and casein protein, both of which are derived from dairy, are slower-digesting proteins, but they provide a longer-lasting benefit over time. Just keep in mind that you won’t get the same quick benefit from these proteins as you would from other options (such as whey). Whey protein is the most common protein found in protein powders. 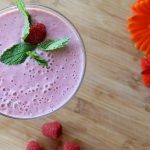 It is easily digested, boosts energy levels, and is great for a post-workout supplement. Hemp protein is one of the newer and healthier protein options out there because it is usually 100% plant-based and contains Omega-3 fatty acids, which are essential for improving brain and liver function. Finally, when choosing which protein bar to invest in, consider the flavor! 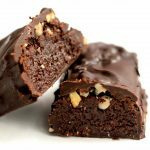 Even though some of these bars are nutritionally-rich, if you can’t stand the flavor enough to eat them, then you won’t be getting the benefit anyway. Sample and try the ones you’re interested in before investing in a lifetime’s supply. Out of all of the options, these bars are the best ones, in terms of taste, nutrition, and price point, that we saw to be the best candidates for women overall. One of the most nutritionally dense and economical choices on our list is ThinkThin. Each bar has 20 grams of protein with 0 grams of sugar. LivBar is one of the most unique protein bars on the list and is made by certified healthcare professionals. This is a bar that you see commonly marketed around town, even at the parks and yoga festivals. A great part about this bar is that it comes primarily from whole foods like egg whites, nuts, and dried fruit. When you think of good protein bars for women, LUNA is probably at the top of the list. LUNA is one of the first nutrition bars out there specifically tailored to suit a woman’s nutritional needs. Not only is PRO Bar nutritionally healthy and also vegan-friendly, but it is also one of the best tasting protein bars out there. PRO Bar comes from plant proteins, so it is GMO-free and Gluten-Free Certified. It’s a plant-based bar that is gluten-free, soy-free, GMO-free and does not have any artificial flavors or preservatives. It is also USDA Organic Certified. Garden of Life is one of the best sports-oriented protein bars out there and uses a unique combination of organic tapioca, peanuts, and pea protein. This bar is another one that is specifically tailored towards women, and it also packs in the protein at 20 grams per bar. This is also a protein bar that is meant for women who are serious about weightlifting and fitness. Simply Protein is a good, balanced, protein bar for women who want to lose weight or maintain their weight while consuming something that won’t stir up any allergic reactions. One of the most nutritionally dense and economical choices on our list is ThinkThin. Each bar has 20 grams of protein with 0 grams of sugar. But something to be careful of is that these bars do contain sugar alcohol, so if you’re diabetic or are trying to maintain a sugar-free diet, then it is essential to be aware of that. But, that being said, it is very low on the glycemic index. However, these bars are on the higher side calorically: each bar has 24 grams of carbs and 240 calories. These bars are quite filling and the texture is that of a crunchy brownie, but the flavor is not for everyone. Even though they might taste sweet and rich initially, they do have a slight artificial aftertaste. Also, if you don’t want something so heavy, then this bar might not be for you. That being said, ThinkThin is a good option for those who want something more filling closer to a meal replacement than a light snack. This bar has become one of the more well-established brands out there, and you’ll commonly see it in supermarkets and convenience stores. It also comes in a lot of flavors: brownie crunch, chocolate fudge, chocolate strawberry, caramel fudge, chocolate mint, chunky peanut butter, creamy peanut butter, cookies and cream, maple almond, sea salt almond, white chocolate, and lemon delight. LivBar is one of the most unique protein bars on the list and is made by certified healthcare professionals. With interesting flavor combinations, such as blueberry vanilla kale and ginger lemon turmeric, this is not your basic protein bar. Other flavors include, raspberry kale maca and coffee maple cacao. You can already tell that each of these bars is packed with superfoods and healthy ingredients. For women who are looking for something organic and non-processed, this would be an ideal choice. All of the ingredients come from fresh and local sources, and most of the ingredients in this bar are organic superfoods. Thus, this bar is gluten-free, soy-free, GMO-free, and corn-free. The flavor of these bars is more than palatable and is full of great nuts, fruits, and seeds. However, they do break apart easily because they don’t contain preservatives. That’s the only downsides to producing a bar that is so natural. So you might have to eat it more like granola than a bar, but the health benefits make that task well worth the investment. For the highly health conscious, this bar would be a great choice. And, considering that this bar only contains high-quality ingredients, the price is $30.37 for a 12-pack. This is a bar that you see commonly marketed around town, even at the parks and yoga festivals. A great part about this bar is that it comes primarily from whole foods like egg whites, nuts, and dried fruit. In fact, each package says exactly what the bar contains right on the wrapper itself; all of the guesswork about the ingredients is taken out. In terms of nutrition, this bar is pretty middle-of-the-road, with, on average, 12 grams of protein, 4 grams of fiber, and 200 calories in each bar. Also, since this bar is made out of entirely natural ingredients, it contains more sugar than the typical protein bar. But since these are whole ingredients, the sugars in this bar are easier on the digestive system than other bars. As you can see by the ingredients, these bars are gluten-free, soy-free, dairy-free, GMO-free, and there is no added sugar. There is a vast array of flavors that RX Bars come in: apple cinnamon, chocolate chip, chocolate sea salt, maple sea salt, coconut chocolate, peanut butter, mint chocolate, mixed berry, berry blast, pumpkin spice, and peanut butter chocolate. When you think of good protein bars for women, LUNA is probably at the top of the list. LUNA is one of the first nutrition bars out there specifically tailored to suit a woman’s nutritional needs. They contain vitamin D and other nutrients to increase bone mass and strengthen against osteoporosis. Moreover, these bars are gluten-free. As far as fiber and protein go, this bar is average, at 3 grams of fiber and 12 grams of protein per bar. However, there are only 170-190 calories per bar, and it is packed with organic ingredients, micronutrients, and minerals. It is also low on the glycemic index. One thing to be careful of is that these bars are formulated from Soy Protein Isolate, so they do have milk, soy, and nuts. This is also one of the best tasting bars out there. It’s also suggested that you microwave the bar for about 10 seconds, then you’ll have a bar that melts in your mouth. Even for those who are hard to please and don’t like the taste of protein bars, this one is sure to surpass your expectations. And it comes in some delectable flavors: berry greek yogurt, chocolate peanut butter, chocolate salted caramel, chocolate chip cookie dough, mint chocolate chip, and chocolate walnut fudge. Not only is PRO Bar nutritionally healthy and also vegan-friendly, but it is also one of the best tasting protein bars out there. It is simply delicious and filling. PRO Bar comes from plant proteins, so it is GMO-free and Gluten-Free Certified. It is also made from Soy Protein Isolate, so it is vegan-friendly. Moreover, soy protein helps to build bone mass, which is helpful if you have osteoporosis or any bone disorders. Soy protein also reduces cholesterol which can help reverse some of the negative stress that menopause can cause. As far as nutrition goes, PRO Bar is packed with protein with 20 grams in each bar. These bars also have 5 grams of fiber. In addition to the plant proteins, PRO Bar also includes flax, chia, and cocoa powder, which injects a healthy dose of Omega-3 fatty acids, antioxidants, and minerals into the mix. The PRO Bar company is also highly ecologically conscious, so it’s optimized business model allows production of these bars to leave a minimal footprint. The only main concern of these bars is the high caloric content. There are 290 calories in each bar, but all of the bars do taste delicious. Considering the nutritional value and rich flavor that each bar has, 290 calories is a small sacrifice to make, especially if you’re aware of the caloric content prior to consuming it. Another concern is that PRO Bars tend to be on the more expensive side at $25.99 for a 12-pack. PRO Bar also comes in a wide variety of flavors, including: Mint Chocolate, Chocolate Blixx, Chocolate Nuts, Cookie Dough, Coffee Crunch, Frosted Peanut Butter, Peanut Butter Chocolate, and Frosted Coconut. 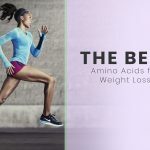 Orgain is originally known for its protein shakes, which were invented by Dr. Andrew Abraham, who had beaten cancer and lived a thriving lifestyle thereafter. 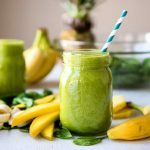 Then he started making organic nutrition shakes because the chemicals and preservatives in traditional shakes made him sick. Now, as he ventures into bars, the result is a great tasting protein bar with incredibly healthy ingredients. 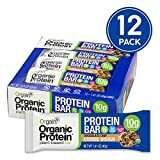 Orgain Organic’s protein bar is better more as a snack than a meal replacement. This bar has a lower protein content with 10 grams of protein per bar, but it also has very few calories at 140 per bar. Thus, it is one of the best protein bars for women for weight loss purposes. This bar also packs in 6 grams of fiber to satiate hunger between meals. Although it might be very filling as a meal replacement, the Orgain Organic bar has just enough to get you between meals. This bar comes in several different flavors: peanut butter, peanut butter chocolate chunks, chocolate chip cookie dough, and s’mores. 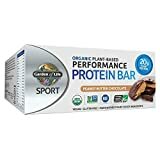 Garden of Life is one of the best sports-oriented protein bars out there and uses a unique combination of organic tapioca, peanuts, and pea protein. It’s also certified by the NSF for sport. It also is certified to be vegan, gluten-free, dairy-free, and soy-free. It also uses 100% organic feed. In terms of nutritional value, Garden of Life is packed with protein with 20 grams per bar. It also has a high quantity of fiber with 10 grams per bar. However, it is also high in calories at 290 per bar and carbs at 33 grams per bar. Reviewers also rave about the flavor and consistency of this bar. The texture is similar to that of a dense brownie, and the flavor isn’t overwhelming with artificial sweetness. Instead, it has a subtle natural sweetness with no bad aftertaste. Furthermore, it doesn’t have the sticky taffy feeling that most bars leave you with. For women who exercise heavily or are using this bar as a meal replacement, this is one of the best protein bars for women out there. Flavors for Garden of Life include: chocolate mint, sea salt caramel, peanut butter chocolate, and chocolate fudge. This bar is another one that is specifically tailored towards women, and it also packs in the protein at 20 grams per bar. Plus, each bar only has 190 calories with 23 carbs and 7 grams of dietary fiber. Hence, this is a fantastic choice as a meal replacement bar. This is also a protein bar that is meant for women who are serious about weightlifting and fitness. Many bikini pros and fitness models sponsor and consume this bar, but it might not be for the casual consumer who is looking for a bar as a light snack during work or school. Also, the flavor is quite polarizing. Some reviewers absolutely hated the whey flavor and threw it in the trash after a couple bites. Just make sure you grab a sample first to make sure that you like it before diving into the deep end after seeing the nutritional facts. But if you don’t mind the flavor, this bar is one of the best nutritionally, especially if you’re looking to gain weight or are a serious female athlete. Nutritionally, this bar is solid with 15 grams of protein, 7 grams of fiber and only 1 gram of sugar and 150 calories. With the high protein and fiber content and low calories, this bar is fantastic for weight loss. In addition to that, these bars are vegan-friendly, gluten-free, and GMO-free. Ingredients-wise, these bars only have a few: chicory root fiber, cashew butter, vegetable glycerin, tapioca starch, cinnamon, pecans, and salt. With these ingredients, the bars taste like soy protein crisps and have a sesame bar-like texture. They are crunchy and crispy, unlike most protein bars, which are overly chewy. As far as flavors go, there is a wide variety: chocolate coconut, cinnamon pecan, chocolate caramel, cocoa coffee, double chocolate, cocoa raspberry, lemon coconut, maple pecan, and peanut butter. Overall, you can see that the protein bar market has come a long way since producing the original chewy and horrendously flavored PowerBar. Now there are a wide variety of offerings with different flavors, textures, nutritional content, and production styles that will accommodate anyone looking for a bar to satisfy their daily hunger. Especially as more women are living busier professional lives and are getting more into fitness and health than ever before, the prevalence of protein bars that are more female-friendly is rising. Brands like Luna and Her Whey are leading the charge by producing and selling bars specifically designed to suit a woman’s needs. However, just because a certain bar is advertised a certain way or has a high rating doesn’t mean that it suits your needs. Remember to keep in mind the ingredients, nutritional content, and price point when selecting the protein bar that is right for you.